The Base Brisbane Embassy Backpacker Hostel is a peaceful haven that is conveniently positioned right in the heart of the city centre. 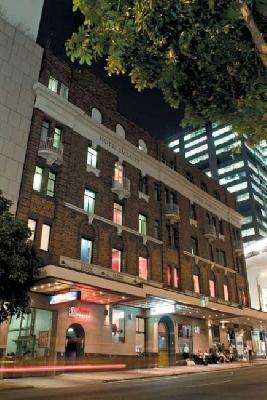 The Base Embassy Brisbane provides state of-the-art facilities and accommodation including spotlessly clean, air-conditioned and spacious hostel rooms. The environment within the property is calm and relaxing, making it an escape from the business of the surrounding city. Guests staying at the Base Embassy can enjoy access to the facilities at the Base Central as well as the shopping at the nearby Queen Street Mall. For travellers looking for cheap hotel accommodation in Brisbane then the Base Brisbane Embassy is the ideal place. This budget hostel features a variety of rooms that are designed for travellers as well as great amenities like direct internet access, disabled facilities, faxing facilities, guest laundry, lift, bbq facilities, airport shuttle and security access. Guests have access to a spotlessly clean, large and modern self catering kitchen complete with cooking utensils and crockery and fridge. 4 Bed Mixed Dorm Room : Sleeps up to 4 guests on 1 Single Bed In An 4 Bed Dorm. 4 Bed Share Dorm-female Only : Sleeps up to 4 guests on 1 Single Bed In An 4 Bed Dorm. 6 Bed Mixed Dorm Room : Sleeps up to 6 guests on 1 Single Bed In An 6 Bed Dorm. 8 Bed Dorm Room : Sleeps up to 1 guests on 1 Single Bed In An 8 Bed Dorm. Double Room Shared Facilties : Sleeps up to 2 guests on 1 Double Bed. Double Room & Ensuite : Sleeps up to 2 guests on 1 Double Bed.